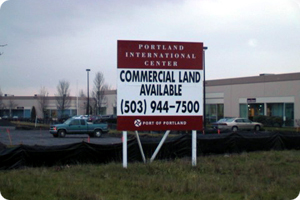 Commercial Real Estate and Property Management | City Sign Company Inc.
City Sign Company is the industry leader in commercial real estate and property management signs. Our clients enjoy knowing that they can place an order and know that it will be processed and installed to their specifications. Are employees are mobile dispatched, experienced, full-time installers. From ground post installs to rooftop installations, we can do it all. Our commercial clients also have customized web based order sheets. This allows us to track orders and it also reduces mistakes. We screen print-stock signs and place them in storage. We then letter and install them when ordered. Your signs, installed on 4×4 posts (unless specifically requested or size and height require larger) with back bracing. Holes are dug a minimum of 24”. All posts and support lumber are painted. We use ½” MDO plywood with a Simpson backer. When your property is sold / leased, we will remove your sign and store it. Contact or request a quick quote from City Sign Company today and let us know how we can help you.